TT's recycling culture is fairly young but more and more, companies and individuals are "going green", be it by changing the packaging they use or by actually providing recycling options for others. 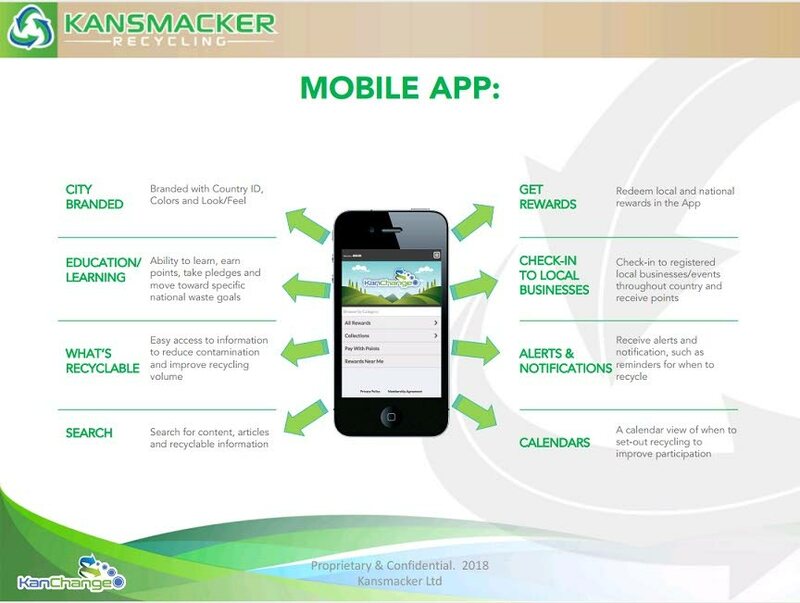 Case in point, Kansmacker Recycling, whose services include its proprietary reverse vending machines (RVMs) to recycle bottles and cans – for schools, retailers and government buildings – and its KanChange.com education and incentives IT platform and application (app). Established in 2016, Kansmacker Recycling is the marketing, distribution and consulting arm of Kansmacker Manufacturing (Kansmacker MFG) in Lansing, Michigan. 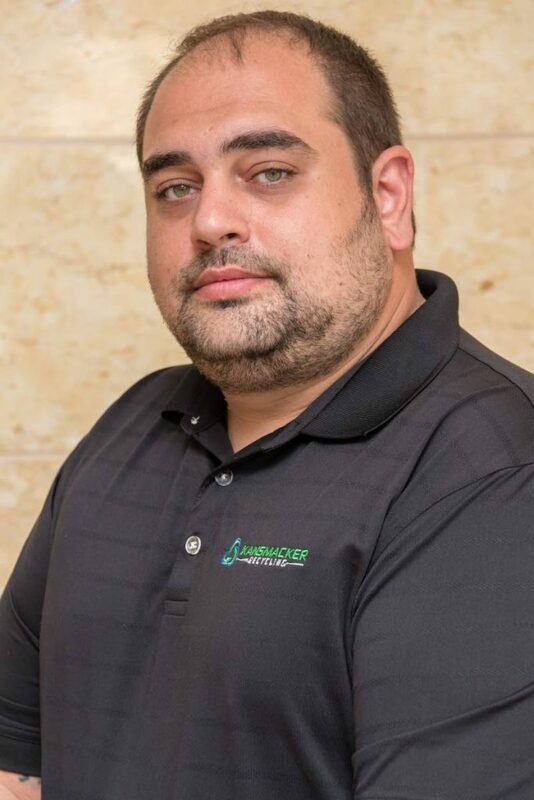 Aaron Yono, director of operations at Kansmacker Recycling, is the son of Nick Yono who founded Kansmacker MFG almost 40 years ago. Established to provide RVMs to meet demand created by the introduction of the Michigan Beverage Containers Law of 1976, Kansmacker MFG's services now include equipment manufacturing, recycling operations, commodity sales and consulting experience in the recycling industry. Growing up in a culture and business of recycling, when Aaron Yono first came to Trinidad seven years ago, his first thought upon smelling and seeing the Beetham Landfill on the outskirts of Port of Spain was, "Wow. This is a missed opportunity for the environment and business (community)." Having fallen in love with and married a local woman, Yono now splits his time between TT and Michigan. He decided to put thought to action, co-founding Kansmacker Recycling with his childhood friend Christopher Moses and entrepreneur Joseph Rahael. Seated in the boardroom of the company's offices at 61 Robert Street, Woodbrook, Port of Spain, Yono spoke with Business Day about why incentives are key to effecting a nationwide shift towards recycling. "Starting anything new, you have to show the benefits. Yes, I could tell someone they're doing this (recycling) for their grandchildren and their grandchildren's children but for many people, that's just not incentive enough. So let's add an incentive. Let's show them you can earn points, earn benefits, from recycling. Which is where our KanChange programme and app come in. Users earn points that can then be redeemed for local rewards." Referring to how lower energy prices have impacted the local economy – shortfalls in government revenue and the resultant re-focusing on green energy/recycling initiatives – Yono argued that "now is definitely the time when you (TT) needs to push recycling as hard as you can." Yono cited the provision of recyclable materials for use by local manufacturers, which would in turn reduce their need for the limited supply of foreign exchange, which is often used to buy raw materials. Another area of opportunity and a foreign exchange earner, is the "exporting of feedstock" to international processors, something that is currently done on a limited scale by companies such as Recycling in Motion and Recycling Waste and Logistics. Kansmacker Recycling also has plans to "build up volumes of feedstock to manufacture new products locally such as compost, fertilisers, soils, building materials, recycle bins, bags, etcetera." On the renewable energy front, the company has tendered for the Ministry of Energy's waste-to-energy project at the Beetham Landfill. In August 2017, the ministry issued a request for the submission of expressions of interest for a waste-to-energy facility at the landfill. This is part of government's plan to meet its commitment to the Paris Accord on climate change to achieve ten per cent power generation from renewables by 2021. This past January, the Environmental Management Authority (EMA) launched the community, awareness, recycle, everyday project (iCARE) – phase two of the beverage containers clean-up project to reduce the amount of solid waste being sent to already overburdened landfills. Plastics can now be deposited for recycling in iCARE's green and white bins, location details of which can be obtained via the project's Facebook page (www.facebook.com/ICARETTproject/). 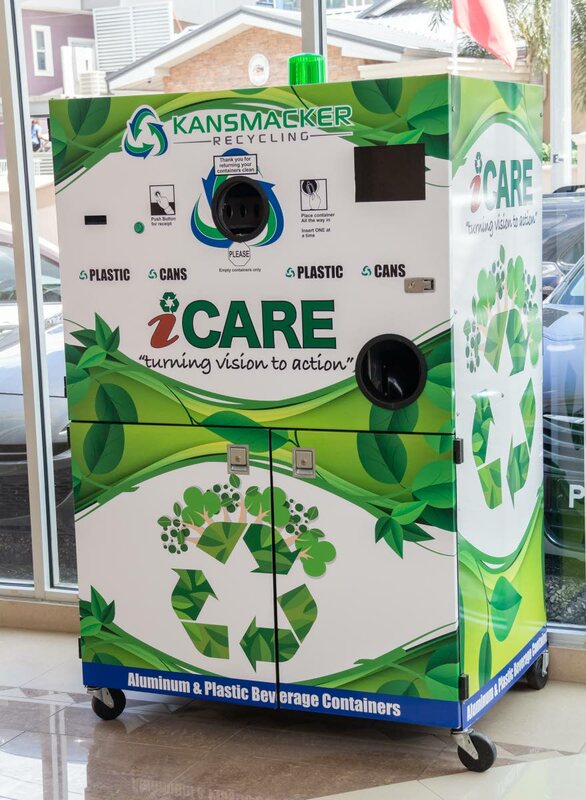 While most people are aware of iCARE, few know that Kansmacker Recycling is involved in the project. In addition to the bins in which you can drop off your used plastics, there is an iCARE-branded RVM in the lobby of the St Clair head office of the Public Utilities Ministry. The link works this way – the EMA has partnered with the TT Solid Waste Management Company (SWMCOL) to execute iCARE. The EMA falls under the purview of the Planning and Development Ministry while the Public Utilities Ministry has oversight of SWMCOL. Hence, the demonstration model of Kansmacker Recycling's iCARE-branded RVM being located at the Public Utilities Ministry. Yono explained that while the relevant parties are "still in the process of finalising things (whereby) iCare is supposed to be purchasing RVMs from us and incorporating our KanChange programme into what they're doing, they asked us to put out a machine in the ministry's lobby to help raise awareness." Another project Yono is excited about is Kansmacker's partnership with Massy Stores. If things go according to plan, later this April, Massy Stores will have an RVM on the premises of three of its supermarkets. Users of these RVMs will be able to get both Massy Points and KanChange points – the latter through the KanChange app, which is free to use. Kansmacker Recycling slide on how the company's mobile app, KanChange, works. SLIDE COURTESY KANSMACKER RECYCLING. Although Kansmacker Recycling approached Massy Stores, Yono told Business Day the supermarket chain "had already decided they want to become green and take the initiative to help curb the problem." "So they are working with us to set up a recycling programme for all of their stores. We approached them around October last year and they took the lead from there. We're finalising the details but yes, we're starting a pilot project with Massy Stores." Yono noted that because of how many locations Massy Stores has across the country, a wide-scale RVM partnership "would have a big impact on the recycling culture here." The ultimate goal is to have similar partnerships with businesses large and small, from gas stations to pharmacies, schools and government buildings, "to make recycling easy (while) providing an additional revenue source for participating businesses when people redeem their KanChange points." Yono also spoke about branding opportunities on the RVMs, to help offset the initial investment in these "lifetime machines." "We have different packages. For instance, let's say the business is a top customer of a beverage company. They can ask that company to pay a certain amount per month to have its logo/advertisements on the RVM. This allows the business to subsidise some of the costs and they'll get the machine branded how they want it." "We refer to our RVMs are lifetime machines because they last for a really long time. I can say that with some confidence because the first one in the current series was put into use 25 years ago and it's still running today. Compare that to other RVMs on the market whose life expectancy is five years." Reply to "Yes, you Kansmacker"